Smile and make eye contact with the people sitting around you. Introduce yourself to people you don’t know. It is important to create a personal connection. Move into the pew or stand up and allow people to enter. Don’t make people crawl over you. After Mass, say good bye and wish your neighbors in the pew a good day. Offer a compliment on a lovely singing voice or their adorable children. Be helpful. If someone asks for directions around the parish property, don’t just point. Accompany the person wherever they want to go. These types of actions send the message that everyone is an honored guest. Encourage your entire parish community to cultivate the approachable and positive attitude of an evangelizer as modeled by Jesus and described by Pope Francis. 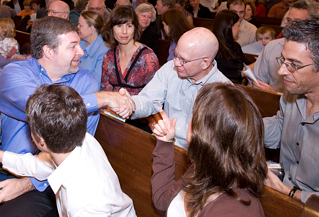 How we respond and journey with people sets the tone for how they view the parish and the Church as a whole.